A study from Emory cardiologists says high sensitivity measurement of troponin may allow cardiologists to identify low-risk patients and cut down on cardiac stress tests, reducing health care costs and radiation exposure. High levels of troponin, a protein released by injured heart muscle, in the blood can tell whether someone recently experienced a heart attack. Measuring lower, but still problematic, levels of troponin can provide useful long-term information for cardiologists, research from Emory University School of Medicine reveals. The results were published this week in the journal Annals of Internal Medicine. 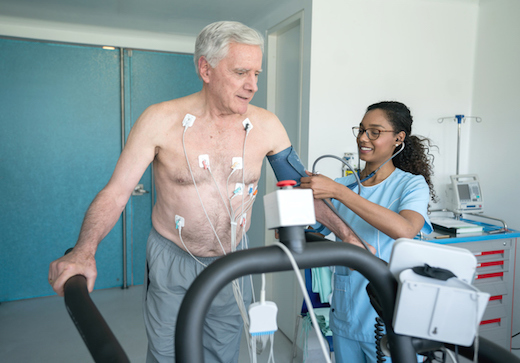 Cardiac stress testing, sometimes involving nuclear imaging, has been common in patients with stable coronary artery disease (CAD), many of whom would otherwise be considered low-risk. Professional societies, such as the American College of Cardiology, urge physicians to avoid routine stress testing in patients with stable CAD. Measurement of troponin using high sensitivity assays (hs-Tn) may allow cardiologists to identify low-risk patients and cut down on cardiac stress tests, reducing health care costs and radiation exposure, says senior author Arshed Quyyumi, MD, director of Emory’s Clinical Cardiovascular Research Institute. A test for troponin is standard when someone with chest pain shows up at a hospital emergency department. In some form, the test has been around since the 1990s, when it could detect nanograms of troponin per milliliter of blood. In the last few years, it has become possible to measure picograms per milliliter – 1000 times less. In this situation, elevated levels of troponin indicate that the heart is undergoing low-level or chronic injuries. Two assays are commercially available: hs-Tn-I and hs-Tn-T.
Quyyumi and his colleagues examined two groups of patients from research studies in which cardiac stress testing, exercise or pharmacological, was performed via SPECT imaging. A first group (589 total, all with stable CAD) was used to figure out the best cut-off level for hs-Tn-I, pointing out which people were unlikely to have inducible ischemia, or problems with blood flow in the heart visible by imaging. Overall, few people in this group had experienced recent chest pain, but stress-inducible ischemia was observable in about a third. They were followed for three years, checking for adverse cardiovascular events: death or heart attack. Using a cut-off of 2.5 picograms per milliliter for hs-Tn-I, the researchers could define a smaller sub-group of 101 patients who had a low proportion of inducible ischemia. “The probability that they would have a positive stress test result is relatively low – less than 5 percent – and their medium-term prognosis is excellent,” Quyyumi says. In three years of follow-up, no adverse cardiovascular events occurred in those with hs-Tn-In levels below 2.5 pg/ml, while 33 people with hs-Tn-I above that level had adverse events. A second group (118 total, all who had experienced a past heart attack) was used to validate the cut-off level, in relation to inducible ischemia. Looking ahead, Quyyumi says the high sensitivity troponin test could be used to triage individuals with stable CAD before performing stress testing. This will likely reduce the numbers of stress tests performed in this population, thus using a less expensive blood biomarker measurement, instead of ECG, ultrasound or nuclear imaging. Muhammad Hammadah, MD and Jeong Hwan Kim, MD are co-first authors of the Annals paper. Co-authors at Emory include Laurence Sperling, MD, professor of medicine (cardiology) at Emory University School of Medicine and Viola Vaccarino, MD, PhD, Wilton Looney Chair of Cardiovascular Research and professor of epidemiology at Rollins School of Public Health. The high-sensitivity troponin test used for the paper was from Abbott Laboratories. However, similar tests are available from other manufacturers. Abbott was not involved in the research, which was supported by the National Heart Lung and Blood Institute (P01HL101398, P20HL113451, P01HL086773, R56HL126558, R01HL109413, R01HL109413, K24HL077506). Additional support came from the Atlanta Clinical and Translational Science Institute (UL1TR000454, KL2TR000455) and the National Institute of Mental Health (K24MH076955).